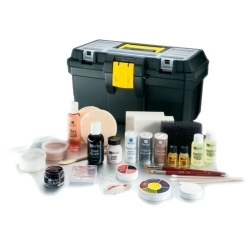 Moulage kits are designed for emergency preparedness training for EMS, Police, Fire, and other government agencies. It includes all of the basics to create dozens of lacerations, wounds, burns, cyanosis, fractures, and more. The kit includes the following items: Trauma simulation guide, six-color master bruise wheel, four color burns & blister wheel, cyanosis foundation, stage blood, gelatin blood capsules, thick blood, modeling wax, bone wax, liquid latex, charcoal powder, plains dust, neutral set powder, laceration prosthetic, spirit gum adhesive, spirit gum remover, quick cleanse makeup remover, brushes, foam sponge, stipple sponges, powder puffs, modeling tool, cotton swabs, carrying case.